Yesterday I wrote about extremes – rigidity and/or laxity in regard to observance of law. 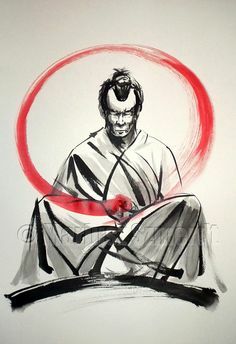 This morning I read a passage from a Samurai warrior in 14th century Japan quoted in the book, Perseverance, by Meg Wheatley that seemed a good example of the rigid end of the spectrum of self-discipline. As I began to reflect on its meaning, however, I could see from a somewhat different perspective the kenotic way of life that Jesus came to teach us, the “letting go” that practitioners of centering prayer hope to achieve. If it seems extreme, take another look; see if there is not value in deep reflection on the meaning.